This is a prime example of how the internet can be detrimental to your BBQ cooking. I searched all the top sites for a good rotisserie chicken recipe when I wanted to try out my new rotisserie accessory for my Weber 22.5" grill. They all said to put a foil pan directly under your chicken and coals to the side. No mention whatsoever of whether or not to put the lid on. No mention of pit temperatures but they did mention it would take about 1 to 1.5 hours to cook your chicken. Most of the recipes seemed to be the same too - like they all just copied it from one another without actually trying it for themselves. So... having watched my Dad and Uncle cook rotisserie chicken on the old charcoal grill many times, I decided to attempt to replicate their method with no lid. I guess I just didn't want to end up with a fast roasted, burnt skin, barely done on the inside, average chicken. When I tried the first time to use a foil pan and indirect heat, it failed miserably - so much for internet advice! Then I did it my way with no foil pan cooked directly over hot coals. Much better results! Tender, fall off the bone meat, juicy as can be, with tasty golden brown bite through skin. Just the way it's supposed to be. Be careful who you take BBQ advice from. Make sure it comes from someone who knows what they are doing. 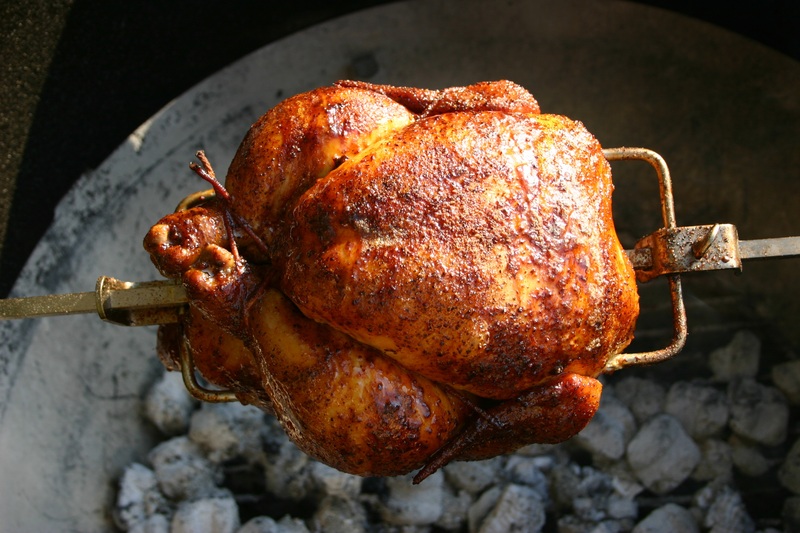 The Skin: Rubbery chicken skin is one of the most dreaded problems in all of BBQing. 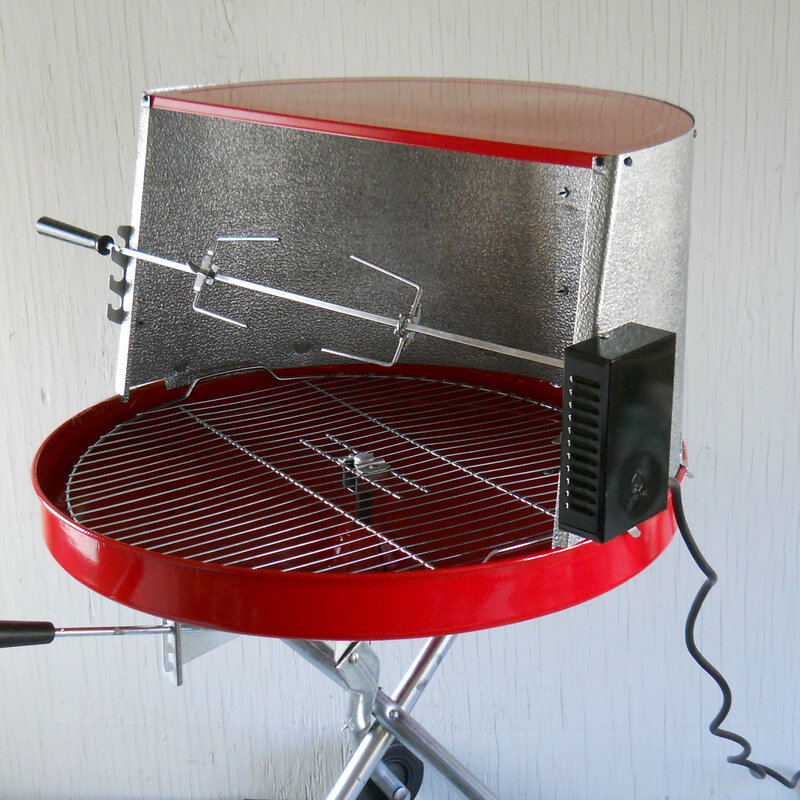 Backyarders and BBQ Competitors and even Restaurants have problems with rubbery skin. Let me tell ya' - if you cook your rotisserie chicken using this method, you will not get rubbery chicken skin. You'll never get crispy skin when you are BBQing. What you are shooting for is tender, bite through skin. There are other ways to get tender skin which I have outlined in this newsletter if you are interested.